Bob was born December 19, 1936 in Ury, Oklahoma. His parents were Weldon Yates Phelps and Lorene Mead Phelps. He graduated from high school at Durant, Oklahoma and received his college degree from East Texas State University. He spent six years in the National Guard and five years in the Army Reserve. He worked three years on a survey crew for the state of Oklahoma. Needing a better paying job joined the Fort Worth Police Department in 1960. He started out walking a downtown beat. There were no malls at this time and every one came downtown to do all their shopping. At Christmas the downtown became a grid lock of cars. He was re-assigned to the three wheel motorcycle squad and worked the North Ft Worth district around the stock yards. After two years on the motor squad he was transferred to the Patrol Division and drove a squad car for the next six years. He drove car number 358 and that was the beat covering the Western Hills and Como areas. 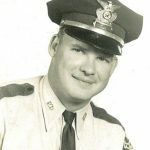 In 1970 he was promoted to the Detective Division and served his last twenty years in that division. While in the detective office he served in auto theft, robbery, theft and homicide divisions. He retired in February, 1990 after serving thirty years on the department. Needing something to do after retirement he was Director of Maintenance at Tolar Independent School District and served there ten years before retiring the second time. He was a trustee for the Pony Creek Baptist Church. On February 17th, 2001 he married Joan Miller and stated she was described as the woman in the 31 chapter of Proverbs. There would be no problems in this world if everyone had a wife like Joan. He is survived by his loving wife Joan, two daughters: Rhdonda Walley and Katrina Phelps. A son Kerry Phelps and three grandchildren: Dustin Walley, Shane Phelps, and Keara Walley, two great-grandchildren: Kiyah Walley and Luke Walley, two step-sons: Tim and Rodney Miller. Preceding him in death were his parents, two sisters and a brother. There will be a family directed Celebration of Life at the Pony Creek Baptist Church Fellowship Hall at a later date. When I was really young he liked to scare me and my brother by hiding in the dark with a scary mask on. He loved practical jokes, and had a great sense of humor. He had the worst comb-over, and I am proud to call him my PeePaw. He was such a caring person. Him and Joan went out of their way to help me in my time of need. Uncle Bob was who I spent my childhood with since Donnie and I were 16 days apart. Uncle Bob say hello to dad and Gan Gan. See you again one day. Praying and sending love to Donny Kerry and Katrina. Mr. Phelps was a great neighbor. My daughter and I lived next door to them several years in the late eighties.